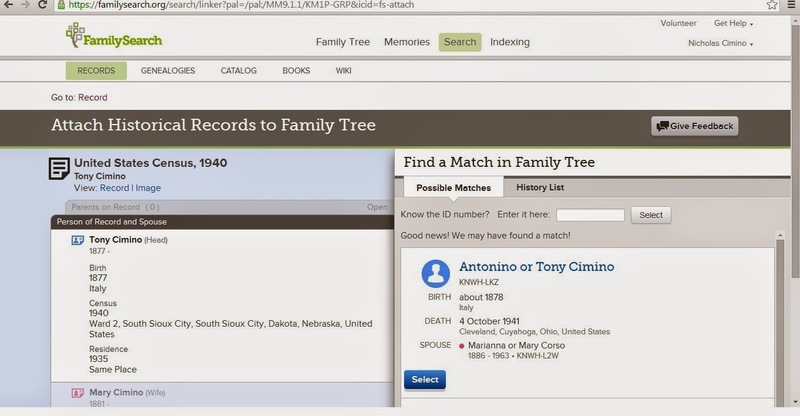 One of the great new features of the Family Tree at FamilySearch.org is the ability to add records to the profile of an ancestor. This is especially exciting when you see the vast collection of online records at FamilySearch.org. I will use my great-grandfather, Antonino Cimino as an example. My dad’s generation called him “Nonnu” which is the Sicilian name for grandfather so I will use that name in the rest of this article. I logged into FamilySearch.org and went to my family tree. I navigated to Nonnu’s profile. On the right hand column I noticed a click box entitled “RESEARCH HELP” with a hyperlink Search Records. I clicked on Search Records and a list of records appeared. I carefully perused the list to see if any of the records mentioned places that Nonnu had lived. I found a record for “Tony Cimino” residing in South Sioux City, Nebraska in 1940. 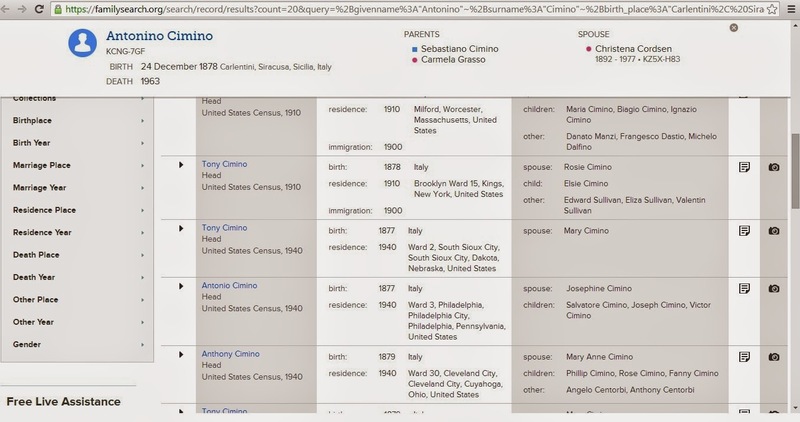 It was his 1940 census record so I clicked on “Tony Cimino”. The record transcript stated Tony Cimino was residing in Ward 2, South Sioux City, Nebraska. He was 63 years old, married and born in Italy about 1877. His wife’s name was Mary. My great-grandparents and their children were the only Ciminos in South Sioux City, Nebraska so it was easy to confirm that this was the right record. In the grey bar above the transcript there was a blue box that said: “Attach to Family Tree”. I clicked on the box and a new page appeared that said “Attach Historical Records to Family Tree”. Family Tree Search Engine found two possible matches for me but neither matched the Person ID number for Nonnu. One of the matches died in Cleveland and I knew that Nonnu died in South Sioux City. The other had the wife of Tony Cimino as Mary Vasino. I knew that my great grandmother was Mary Ossino. This record could have been entered by someone else in my extended family so I made note of the Person ID numbers to refer to later. I entered Nonnu’s Person ID and his record populated the right hand column. I clicked on the record information in the left column and attached the 1940 and 1935 Residence information to his profile. A box appeared asking for a REASON TO ATTACH SOURCE. I typed the following words into the box: “My great-grandparents and their children were the only Ciminos in South Sioux City, Nebraska”. This shows that I have personal knowledge of the family and that it was a reasonable decision to attach the record. I clicked attach and followed a similar process to attach the record to the profile page for my great grandmother, Maria “Mary” Ossino. The process was pretty easy but you have to be careful because Family Tree does not always find the right persons to match with the record as you saw in this example. It pays to keep your Person ID Numbers on a cheat sheet and review those numbers to make sure that you have a match. The process can be tricky. I would be happy to consult with you or assist you in building Your Family Tree on either FamilySearch.org or Ancestry.com.